 Worst drawdown: HSL (9.5%), ETF (13.0%), from May 2015 to October 2015. 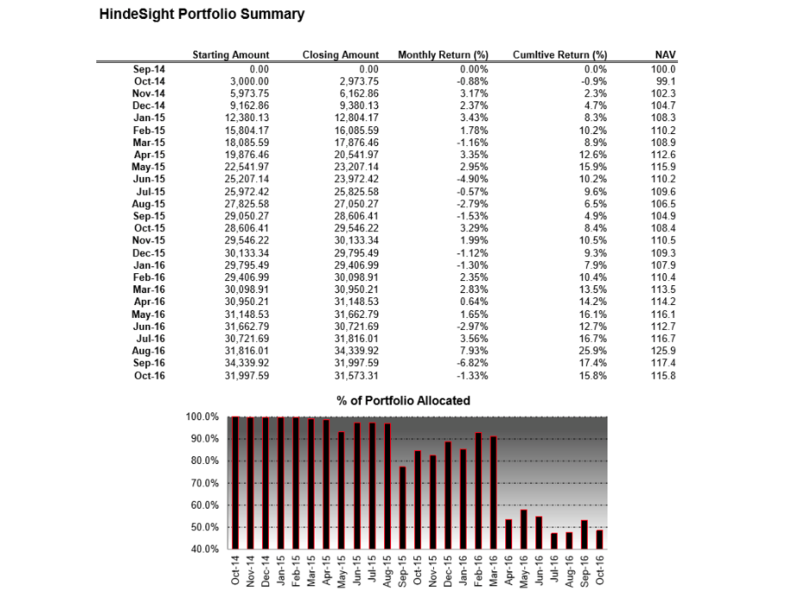 The HindeSight Dividend Letter and its portfolio have been live since September 2014. Since then until April 2016, we have recommended 44 stocks, out of which 25 have been sold from the portfolio. Some have hit profit targets, others have hit stop losses (each recommended stock has a 25% maximum loss risk – the stop loss and is exited if that is breached). The peak stock portfolio was 27 stocks in Aug 2015 and we currently (end of April 2016) hold just 17. As with any stock advisory newsletter, it is important to demonstrate a system to the readers and monitor both its progress and its recommendations. The whole point is to help readers to invest their hard-earned monies wisely and hence profitably. Most readers will not follow our advice completely as regards to stock selections or timing, as investing depends on everyone’s personal circumstances and opinions, but a methodology for recording your track record is key to continued success. There are many ways to measure an investment track record. Most stock advisory services focus on the winners to losers’ ratio and the average percentage gains per recommendation. At the back of each newsletter, we show the total return of each open and closed recommendation accordingly. Our record on these metrics is as follows: winners to losers’ ratio 25:17; average total return gain 3.12%; average total return gain compared to Index 7.96%. However, we feel that the best way for anyone to look at an investment track record is to record the monthly returns exactly in the same way you would an investment fund with the % change in Net Asset (or Liquidation) value being between the start of the month and the end of the month. An investment fund that offers monthly dealing will see new monies enter the fund (as new capital is introduced) or monies redeemed on any month end that will have to be accounted for. From the inception of our HindeSight dividend portfolio, we have recommended introducing new money into ‘your own fund’ over a period of several months in order to build up to a total portfolio size of 25-30 stocks, which would be the maximum size, and then rotating the stock selection. Sometimes, like at present, the portfolio would have less equity exposure and higher cash allocations. The reasons for this will depend on the stock level targets or stops being reached, as well as the intra-year seasonality. We will always tend to hold more cash and have more defensive stocks in the summer months and vice versa in the winter, according to normal equity investing patterns. The table above shows the details of the investment process. We have assumed that each stock allocation will be £1000, but obviously any amount can be used. New monies were introduced to the fund each month until October 2015 and these were fully invested into the recommended stocks. The monthly return is then calculated as the difference between the month’s net asset values. The total amount of money introduced into the fund and invested was £29,000. Clearly, the account balance of £31,148 at the end of April 2016 would suggest that the total % profit is 7.4%, which is different from the 14.2% that we have as the NAV. It is not the easiest concept for people to get their heads around, but one way to look at it is to only think of the invested capital in the fund. Any money that has not been invested into the fund, either as cash or equity holdings, is outside of the fund and potentially earns a return independently. For many months, until Sept 2015, most of the total introduced capital of £29,000 was outside of the fund and hopefully earned elsewhere. You can only record a return on total capital that is available to actually invest in the fund. In order to compare the change in NAV of the HSD fund over the last 18 months with relevant benchmarks, we recognise that any comparison is fraught with debatable issues. Sadly, cash on deposit or in the best interest bearing account will earn a negligible amount these days, and so we have an easy benchmark of £29,000 cash saved over the last 18 months. The value of the account today is also £29,000. A more relevant benchmark, especially in these days of much touted passive investing, is to assume that each time that you invested in one of the recommended stocks you had the choice to buy a generic UK equity Exchange traded fund instead for your equity exposure, and each time you sold a fund stock you sold the equivalent ETF pair amount. So, instead of choosing a cheap value stock that was chosen by a tried and tested model, you chose to take the equivalent equity exposure in a wide group of 100 stocks of the FTSE100. There is nothing wrong with this approach and there are multiple papers written about how passive investing beats most active investing and there is some truth in that, but it is once again hugely debatable. Yes, it is true the average fund manager over the last 15 years has probably underperformed the index by some margin. This is partially as a result of the high fees, which have declined in recent years, but you often find fund managers who are naturally more defensive and others that are more aggressive. Neil Woodford, one of the best- known equity managers, appears to significantly outperform indices over the long term, usually as a result of being defensive before a crisis. Unfortunately, he tends to lag his more aggressive peers on equity recovery rallies, such as those seen since the 2009 lows. Most managers who focus especially on smaller companies have done extremely well over the last 5 years, as the FTSE 250 has outperformed the FTSE100 considerably. Unfortunately, it seems difficult for many fund managers to outperform a bear market decline and outperform a bull market rally over the cycle. Personally, I would like to make the best risk adjusted return and avoid catastrophic losses. There is not much joy in announcing that you have lost ‘only’ 20% when the index is down by 30% and you cannot expect many congratulations. The HDVS targets an outperformance to the FTSE100 index of 10% per annum in NAV change. If the FTSE100 is up 10% we would hope to make 20%, and if the FTSE100 is down 10% we would like to be flat but we are very focussed on the downside protection when stocks are very overvalued, as they are currently. We would also like to see lower quarterly volatility within that target than the index, especially in down drafts in the index price, as we witnessed last August, as well as this January and February. One of the first observations that many investors make after a bear market decline is how much more in % terms they have to make on the way back up in order to break even. When people saw 40% portfolio declines in the 2008 crisis, they had to make 66% gains so as to get back to pre-crisis levels. Avoiding these large drawdowns is the best way to take advantage of the next upswing and it is crucial to staying in the game. We have in effect 3 different investment strategies, as both the table and charts show, maybe made by three brothers. Brother 1 believes that cash is king and saves it to get £29,000 and hold it safe in his pot. Brother 2 invests in an ETF index tracker. Brother 3 decides to invest according to the HDVS. Since September 2014, the NAV increase in return terms for the cash investor is close to zero. The ETF investor is – 3.8%, while the HDVS investor is up 14.2%. The index itself has dropped by -5.76% over this period. These numbers are totally in line with the strategy. The outperformance is marginally better than the 10% index outperformance per annum, while the volatility on drawdowns has been less. This is the portfolio that we will be tracking in the monthly issues of HSL, but naturally many of our new or existing subscribers will wonder how they can start now, if they didn’t start at the beginning. The answer is simply to assume that the new month’s selections are the start of your portfolio and you then you can build from there, exactly as we have done since our inception. The concept is the same – drip feed into a stock portfolio and then build this up to a desired size, before rotating it accordingly. Most research suggests that part of poor equity investing comes from having either too few or too many stocks, and somewhere between 20-35 is optimal. The HDVS will tend to average around 25 stocks over the course of a year.  Drawdown history of both the HSD and ETF portfolio (drawdown relates to the declines in value of the NAVs, from prior peaks to the troughs, i.e. what you thought you had in the bank compared to what it went down to, before springing back up again in value).  Worst drawdown: HSL -9.41%, ETF -13.21%, from May 15 to Sep 15.